We create outdoor spaces for living, entertaining, competing and working within. We are experts in providing the extraordinary experience that outdoor space enables. Our commitment, expertise and extensive range of superior products ensures that your commercial or residential outdoor space is stunning and sustainable - Warm in Winter & Cool in Summer! All of our products are designed and manufactured to exact specification. Our extensive knowledge, commitment to customer service and professional installation ensures a seamless experience for clients. All of our installations come with a five year warranty & annual maintenance. Creating outdoor spaces for living, entertaining, competing and working within. Designer Shade Solutions will design, manufacture and install the perfect roof or covering for your commercial or residential outdoor space. See our range of roofs and coverings here. VertiGlass is a custom designed and manufactured system providing a distinguished durable and adjustable glazing system to create isolation, weather protection and create truly spectacular outdoor spaces. Designer Shade Solutions provide a wide range of screens, barriers and outdoor blinds. An increasingly popular product for cafe’s, bars, hotels and restaurants, allowing you to enclose outside areas for use all year round. 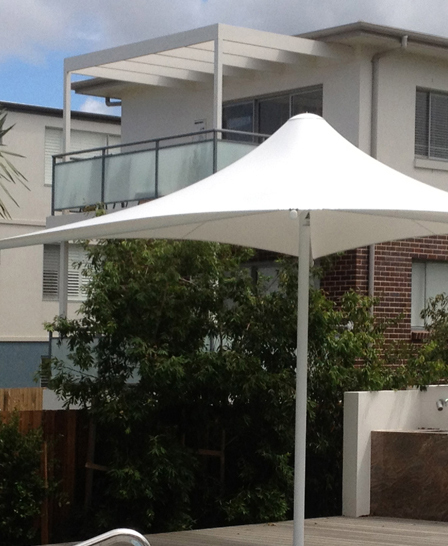 Our architectural designed and engineered umbrella offerings are the perfect choice for outdoor entertaining and leisure areas. Outdoor heaters have become a staple in modern outdoor living, dining and entertainment areas. If you're unsure as to which style of heater would be most suitable for your home or business, we will happily advise on the best solution to meet your requirements. Designer Shade Solutions has decades of expertise in creating outstanding designs and installations, ensuring the best use of outdoor spaces. We have central operations in Australia and Ireland, providing clients with premier outdoor spaces for living, entertaining, competing and working within.